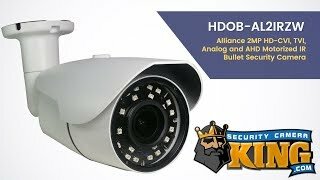 A great new addition to our Alliance series of professional surveillance products is this 1080p 2MP motorized varifocal zoom lens camera with a CMOS sensor which will provide you with a great picture quality compared to older analog cameras and can be used indoors or outside. This is a Quad technology camera that works on standard coaxial cable or Siamese cable and can function using HD-CVI, HD-TVI, AHD or Analog technology which can come in handy if you are wanting to upgrade some failing cameras using an older, existing DVR that is still functioning but you are not yet ready to upgrade your recorder. You can put this camera on any one of our QDVRs, PENDVRs or even our older TRIDVRs and simply choose the technology that works best for you. These will also work on other manufacturer’s equipment as long as it supports one of the above technologies. 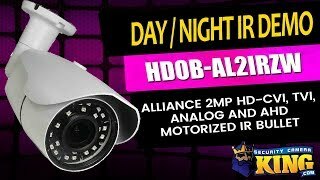 This camera has Infrared LEDs that enable you to see up to 131 feet in the dark and works off of 12v DC power and draws minimal power with a maximum of 4 watts. This camera features a motorized zoom lens that lets you adjust your field of view from a wide angle 2.8mm view down to a zoomed in narrow angle 12mm view either from the recorder or even remotely via smartphone app. This eliminates the need to climb up and down a ladder to make adjustments to the view. This camera does not pan or tilt and is not a PTZ, if you are looking for one that does you can find one in our PTZ section. 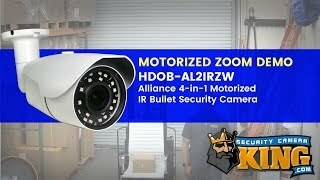 This 2MP Alliance bullet camera is backed by a one year warranty and when you purchase this from us, you receive FREE U.S. based technical support for the life of your product along with FREE remote viewing apps for Android and Apple devices.